Be part of Johor’s next industrial revolution. Easy Access via EDL Highway (no toll charge), 15 mins to JB CIQ. Close proximity to Pengerang Oils & Gas Industrial, billions dollar investment by Petronas Malaysia. 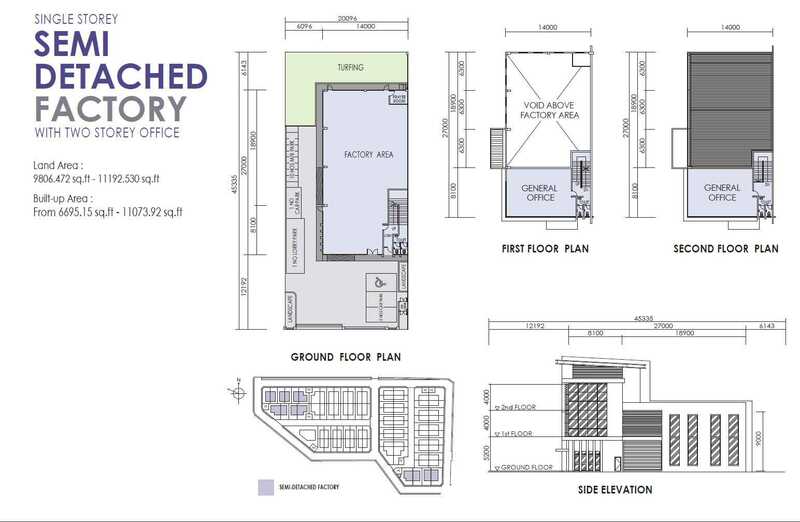 Single storey detached factory with two storey office = 1 unit SOLD OUT! Single storey semi-detached factory with two storey office = 14 units SOLD OUT! Single storey cluster factory with two storey office = 72 unitsTOTAL UNITS: 87 units – Limited Units Available! Harvest Green is the first secure gated and guarded industrial park within Iskandar Malaysia’s Flagship D with key economic activities focused on heavy industries and logistics, including electrical and electronic (E&E), chemical, oleochemical, food and engineering-based industries. 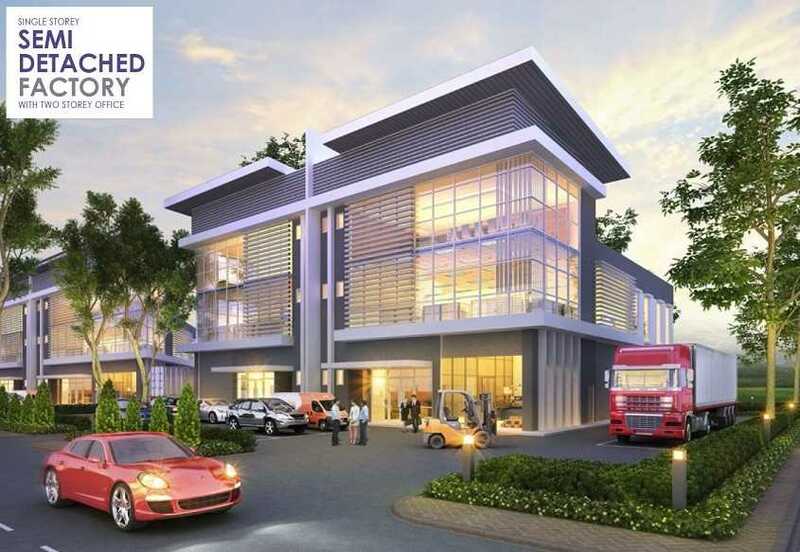 Harvest Green is within the renowned Sime Darby Business Park. Harvest Green Business Park is located in between Tanjung Langsat and Johor Port of Iskandar Malaysia Flagship D. With superb accessibility via Senai-Desaru Highway, Coastal Highway and Pasir Gudang Highway, you’ll have access to major amenities including Tanjung Langsat Port and Johor Port, which ensures the success of your industry. Built on 23.6 acres of freehold land, the Harvest Green comprises of cluster, semi-detached and detached factories. Harvest Green is fully equipped with Ready Built Facilities (RBF) Solutions that ensure the immediate availability of facilities to propel your business forwards. Be assured of plentiful and most importantly, dependable electricity supply that mitigate the business risk. The power supply is efficiently sourced from 2 separate power plants- Sultan Iskandar Power Station & YTL Pasir Gudang Power Station. In additiona, Natural gas supply is available on site via dedicated line to ensure seamlessly operation of your business. In term of security, the gated and guarded industrial park is highly secure environment with 24-hour CCTV monitoring and Police Station is just merely 2KM distance from Harvest Green. The Flagship D area has the largest concentration of palm oil refining industries and downstream activities in the world. This industrial and manufacturing hub is focused on the electronic, chemical and logistics industries. There are more than 300 factories in the area. Johor Port handles a diverse range of cargo and provides marine services such as towage, piloting, ship-to-ship transfer, bunkering and supplying of fresh water. The port’s management also runs the Johor Port Free Zone and property management and warehousing services. TLP is the third port in Johor. It is designed to complement the Port of Tanjung Pelepas and Johor Port in Pasir Gudang. It handles bulk cargo such as liquefied petroleum gas and dangerous chemicals. It has more than 304ha of land within the port area and a 4.5km shoreline fronting the Strait of Johor. Pasir Gudang Industrial Park, which covers 1,523ha of land, is one of Malaysia’s most successful industrial townships. The existing tank farm facilities in Pasir Gudang include the world’s largest edible-oil tankage facility, and caters to companies operating within the hinterland of Pasir Gudang. Harvestland Holdings SDH BHD (HLH), through its wholly whole subsidiary, Harvestland Development SDH BHD (HLD) positions as a niche Ready Built Facilities (RBF) Industrial developer, headquartered in Malaysia that specializes in realty land sourcing, acquisition, RBF industrial planning, development and commercialization within Iskandar Development Region (“IDR”). It is established through decades of combined experience in Real Estate, Industrial Management and Power and Utilities fields among the founding partners of the company. HLD strives to build strong relationship with several key land bankers/owners and professional within its networks continuously in allowing the effective sourcing of strategic or prime lands for acquisition within the IDR, and getting the necessary licensing and approvals during the project implementation and planning to actual development stages in achieving the most efficient Gross Development Value (GDV). HLD also provides niche value added professional works for its clients, (co)investors and (co) developers range from project licensing /implementations to comprehensive sales and marketing strategies for development projects. The company aims to provide the most comprehensive one stop solution platform in Realty Investment, Development and Management works in the IDR. 3. Within Sime Darby Business Park, with World class infrastructure, accessibility to utilities (electric, gas and water supply) and international sewerage system. 4. Strategic location in Flagship D with key economic activities focusing on heavy industries, chemical. oleochemical, food, electrical and electronic ( E&E) and engineering based industries. 8. ESTABLISHED INDUSTRIAL, COMMERCIAL to support your business activities. Natural gas supply is available on site via dedicated line. Be assured of plentiful and most importantly, dependable electricity supply that mitigate the business risk. The power supply is efficiently sourced from 2 separate power plants – Sultan Iskandar Power Station & YTL Pasir Gudang Power Station. Harvest Green at pasir gudang industrial park is strategically located within Iskandar Malaysia’s Flagship D – Eastern Gate Development. Harvest Green is positioned between Tanjung Langsat and Johor Port. 5 mins to Johor Port, nearby Tanjung Langsat Port, Tanjung Puteri Golf Resort and Rapid Pengerang Oil & Gas Hub Project. Direct access to Pasir Gudang Highway, Coastal Highway and Senai-Desaru Highway.